Snow removal subcontractor Ron Bucci got an extra special Christmas present under the tree this holiday courtesy of THE BOSS Snowplow. 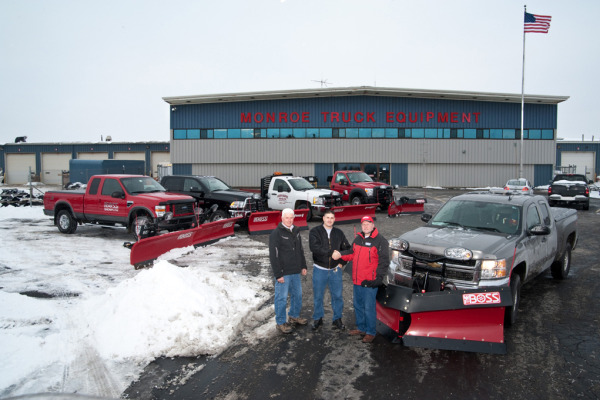 Bucci learned on Christmas morning that he was the winner of THE BOSS Snowplow’s Ultimate Christmas Giveaway. His prize? THE BOSS Snowplow of his choosing. On Friday, Jan. 13, Bucci picked up his prize − a new 9’2” Poly Power-V XT − from Monroe Truck Equipment, 1051 W. 7th St., Monroe, Wis. The Ultimate Christmas Giveaway online sweepstakes kicked off Dec. 19 at 4 p.m. CST and closed at 8:00 a.m. CST on Dec. 24. The Grand Prize winner was announced via THE BOSS Snowplow Facebook page on Dec. 25.